A Smart Office? iBeacon Your Pardon? Home / Insights / Blogs / A Smart Office? iBeacon Your Pardon? Do your employees track and record their hours? Chances are the answer is yes. Do you have to reserve a conference room when you hold a meeting with colleagues or clients? Again, I bet you are nodding your head. Do you ever wonder how much money a meeting is costing your company and whether the cost was worth it? Some of you may be sitting in one of those meetings now. These are just a few examples of areas where a smart office could have a huge impact on a company’s efficiency. Smart offices can control much more than just the lights and temperature in the office. With Bluetooth Low Energy (BLE) gaining momentum in retail and advertising, we are beginning to see a spillover into smart offices. You may think, “Well, smart offices are probably similar to smart homes.” In many ways that is true, but in others they are very different. For example, both smart home systems and smart office systems use sensors to detect when someone is in a room, but if the system is using BLE the room may actually knows WHO is in the room. 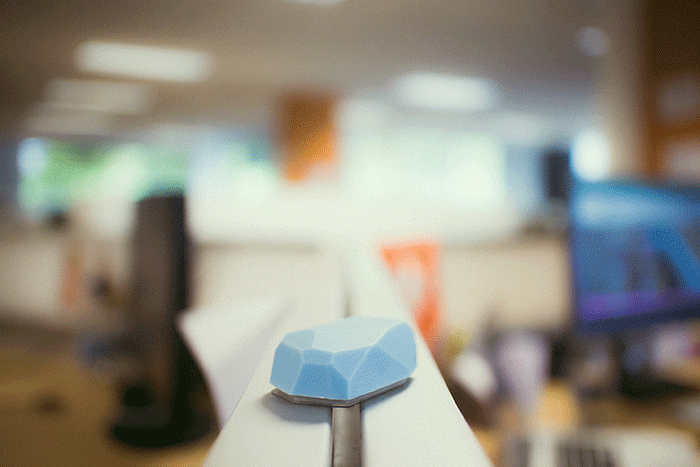 You may also hear people use the word “iBeacon” when talking about BLE. 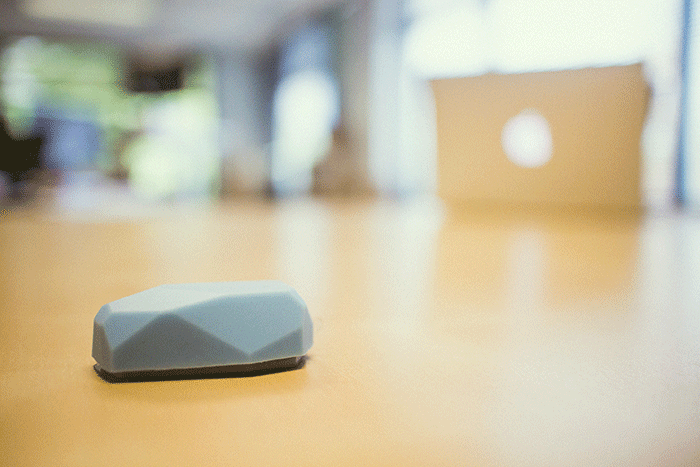 iBeacon is Apple’s BLE product. Another brand you may hear mentioned is Estimote, which is pictured above and below. This technology opens the door to identifying individuals, which is one of the reasons we are seeing smart offices take off. At your home it’s probably only you and a limited number of others, maybe your husband or wife, perhaps some kids and a pet or two. In offices, there are many individuals who have different habits and needs in different environments. Knowing who is where and when is powerful because knowing this information allows systems to reduce the effort to complete a task or even automate the task completely. Logging time spent in rooms in the office. If the system can track which rooms you are in; at what time and for how long and has access to your calendar, the system should be able to pre-populate a timesheet that an employee can then review, validate and approve. Automatically reserving a conference room. Wouldn’t it be great if your smart office could look at your calendar and see how many attendees were in the office and automatically reserve a conference room that will accommodate the number of attendees? Or even better let you know that a colleague was still in another meeting down the hall! Calculating the value and bottom-line cost of a meeting. From a financial and operational standpoint, the ability to calculate the hourly cost of a meeting could be a great way to track trends and reduce costs by learning the cost- efficacy of a meeting; which meetings require which resources/ people and which don’t. Are there any correlations between the number of people present or needed in a meeting in order to increase the value of the meeting, or in the title/status of employees/executives present in the meeting that translate into greater business returns? This is a valuable question that could be answered with the data collected by a smart office application. These are just a few of the things we discussed during a recent Lunch & Learn presentation I gave at 3Pillar. One of the main takeaways of the conversation on smart offices was that they aren’t all about lights and thermostats. There’s also a huge efficiency and employee morale play that could be made possible by simplifying the life of each and every employee in a company. Whether it’s in-home or in-office automation, I suspect that “smart” environments are ones that we will be reading much more about in the future. Below is just a smattering of some of the major recent movements in the space. Do you think the connected office is a passing fad or the real deal? At 3Pillar we can see the value and staying power of the combined technologies of Bluetooth LE, automation applications, and even wearables. If you are interested in learning more about what we have already done to prototype an iBeacon conference room reservation system for iPhone and Android, read this recent post by 3Pillar’s own Aaron Roberts. Great thought..Its amazing where no need to swipe your I Card on machine or thumb impression.